At the beginning of the year, I told myself, I should get out of my comfort zone and try a new bake at least once a month. So for this month, the new item on my 'baking' list is none other than Steamed Cupbread, or commonly known as mushi pan (蒸しパン), a Japanese steamed cupcake. 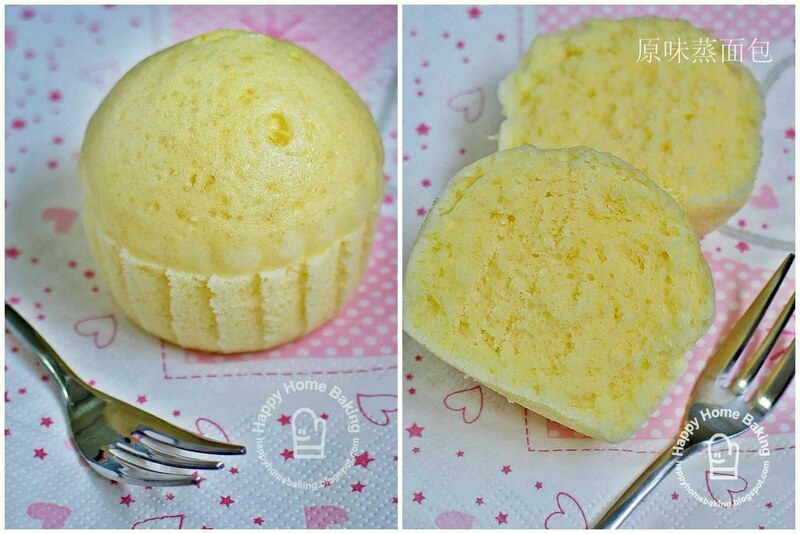 These steamed cupbread or cupcakes are very simple and easy to put together. All you need is a hand whisk to stir the ingredients together. I made a couple of them topped with pork floss and they turned out nicely domed...I had expected them to crack like huat kuih, lol! While the steamer is preheating, whisk egg in a mixing bowl. Add in sugar, beat till sugar dissolve. Add in milk, whisk to combine. Sieve over cake flour and baking powder, whisk to combine. Add in vegetable oil, stir till mixture becomes smooth. Pour mixture into paper cups (or pudding moulds or ramekins lined with paper liners) till 70-80% full. Sprinkle top with some pork floss (about 1 teaspoon). Place in the steamer and steam over medium-high heat for about 12~15mins or until a toothpick inserted into the centre comes out clean. Remove from steamer and let cool on wire rack. Best served warm. They look very cute and good. I tried steamed banana muffins and I wont say they are not nice but just like you havent fall in love with steamed types. Amazed that you write both English and Chinese so well. HHB, I loan this book too and was about to try it and you beat me to it. Hhahaha..
Lovely... This looks v healthy. i am going to make it someday!!! I am in love with your cake cases, where do you get them from, if you don't mind sharing? Yummy Bakes, nah, the true fact is, I can't write well in either languages! Ellena, I was inspired by your mushipan! Your cupcakes rose beautifully and the domes are all so evenly shaped ! Lovely ! Interesting! and the domes look soo cute! Lovely!! May I know for the pork floss version, when do you add the por floss? Thanks. Hi, add the pork floss after pouring the batter into the paper liners, just before steaming. Hi Jehanne, I saw similar ones, just the pink ones over at Phoon Huat (Bencoolen Street) this morning, you may want to hop over if you can't find them at Sun Lik. I tried this recipe but my bread didn't rise at all and it was quite dense. Hi, not sure what went wrong? could it be due to your baking powder?